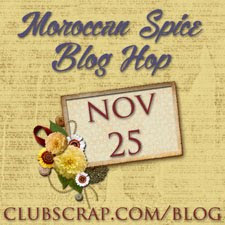 Erin, the blogger of Pages of Pictures, has a tutorial challenge going on. She has challenged her readers to pull out an unused/ unloved tool and create something with it. I chose my Wizard Embosser by Spellbinders, as it is one that I have recently fallen back in love with. Since buying it a few years ago at a Stamping Expo, I've used a number of things to run through the machine with Club Scrap cardstock, but I'd gotten tired of those things and hadn't used it in a long time. Then, when doing a Little Fat Book swap this winter with the Club Scrap Chat forum, I received a lot of 4x4 cards using a unique embossing template, which I later learned was called Cuttlebug (this is by Provocraft). 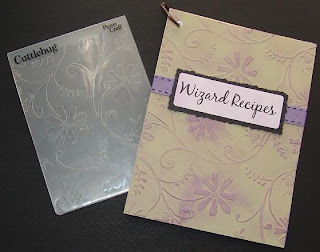 Now, I'm not going to go out and buy another embossing machine since I already have the Wizard, so I did some research and found out that I can use the Cuttlebug embossing folders with my Wizard! I ordered a few of the folders, and when they arrived the other day, I pulled out the Wizard, dusted it off, grabbed some luscious Club Scrap cardstock, and embossed away! I was so impressed with the result! I've made two projects with my old tool (the Wizard) and my new toys (the Cuttlebug embossing folders). The first project is a little booklet to keep my Wizard Recipes handy. 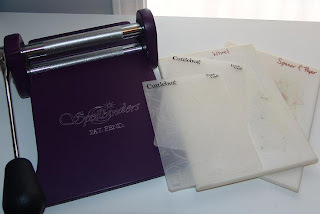 This info is from the Spellbinders website, and it gives lots of ideas on how to use the Wizard to cut and emboss items, and how to stack the plates, cardstock, and embossable items to run the "sandwich" through the machine. My second project is for the spring Little Fat Book swap at the Club Scrap Chat forum. 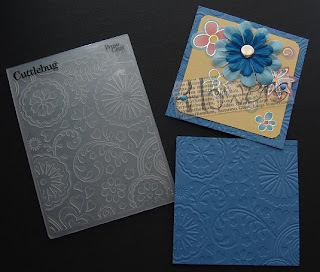 I ran the blue base paper through the machine with another floral Cuttlebug embossing folder. The pic shows the decorated side and then the back of another 4x4 page. I like the way the embossing dressed up the foundation page. So, now I've gotten my old tool back out and I'm glad I did. Now I have to order more Cuttlebug embossing folders to play with! It's much better than the Wizard sitting around gathering dust.